Again, when exam comes, i ran into the toilet and when i’m out i become SUPER EVE! That’s because my body battery runs on double energizer. I can go with just less than 6hours of sleep in more than 50 hours. Even that is not 6 hours straight. I’m like taking cat nap in between. An hour here, 2 there. HAHAHAH !! No wonder i get those huge eye bags. So i have 2 more papers. 1 super tough one because the lecturer is very serious in what he do. Aigh…another one bites the dust i guess. I don’t even think that rhymes at all!! HAHA It’s alright, i like it. Anyway, i found out that quite contrary to common belief, guys have bigger mouth than girls and do tongue wagging more ok -.-|| So don’t say girls gossip anymore!!! Here’s a snippet of what i’ve been doing. haih. 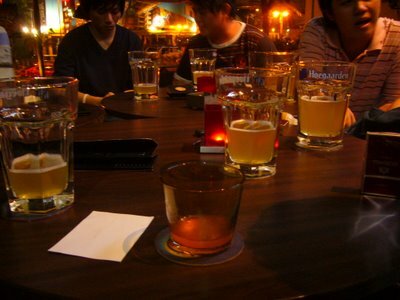 now my hoegaarden kakiz not staying wif me d. sob sob..
hey Penang lang… I 1st time drop by here. Anyway… good luck in ur exam ya! Cheers… I like the beers la… hahaha. yeah…come guys gossip even worse than girls..
christal: got meaning wan k! Jason & al: good eye sight! that’s some good stuff! haha Don’t think penang got maybe ingolf ? ?